Remapping Warwickshire was a participatory research event during Museums at Night 2015. 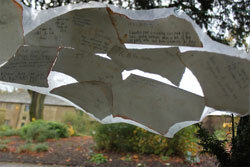 Members of the public wrote and illustrated stories about sites of personal significant within Warwickshire County. 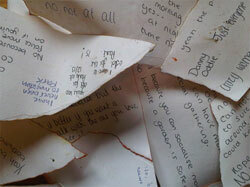 The stories accumulated throughout the day as a growing book in a market stall. This content gathering event is part of a participatory research-based residency with Heritage and Culture Warwickshire in response to the Sheldon Tapestry Map which will be redisplayed in 2016 at the Town Hall Museum. 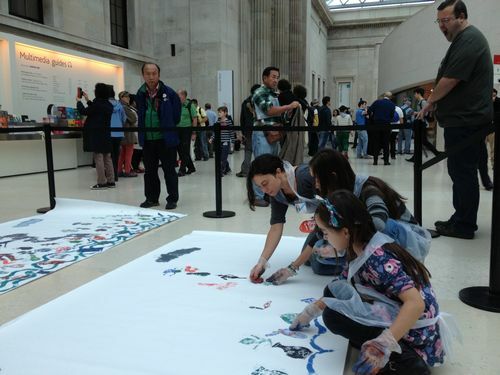 Interpreting the Islamic art gallery through a participatory hand-printed mural making and storytelling event with supplementary schools and museum visitors. Inspired by Islamic designs, magical cups and the tale of The Fisherman and the Jinni. 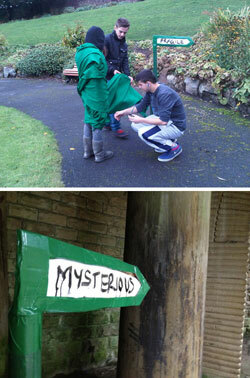 A three-week residency in Pendle, exploring how the parks and wider countryside is (can be) used through creative interaction. 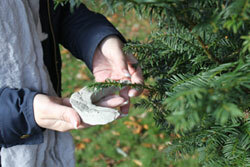 1.Clay Book of the Park - a collaborative book made together with park users, using clay to take impressions of the park's surfaces and textures. 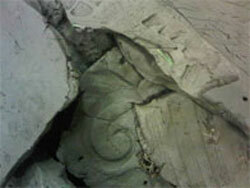 The clay fragments were cast into plater. 2. 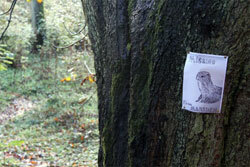 The Lost Signpost - an interactive performance and creative writing piece in which people write how different of the areas of the park feel on a wandering (human) signpost. Made with park users and with young people from Safe Space. 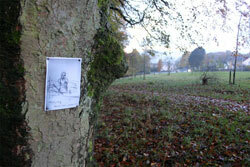 A series of posters based on missing elements of Marsden Park. Based on archives and anicdotes of park users. 4. 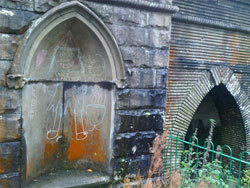 Temporary site-specific drawings with young people from Safe Space around Marsden Park. 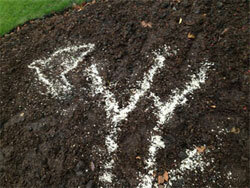 Below - chalking and drawing with bird-seeds. Following a discussion about 'what you need when you set out on a journey? ', young people made their own journey-sticks to navigate around the museum galleries, looking for words, images and ideas that represent different ingredients neccesary to complete a journey, considering a journey's stages, and what makes a journey worthwhile. Participants then shared their findings through a collaborative labyrinth drawing, recalling their walk through the museum and objects in the collection that represent the varoius elements of a journey. These initial ideas were then used to develop lyrics about the theme of journeys, and the lyrics were turned into a collaborative calligraphic piece for a bus shelter poster near Ismaili centre in South Kensington. 2010-2011. 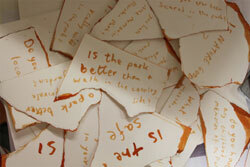 Above: calligraphy experiments with Rahima Rashid, turning the lyric into images. Below: Collaborative maze drawing and journey sticks created with young people from the Ismaili Centre at the London Transport museum, exploring the idea of journeys and the museum collection. 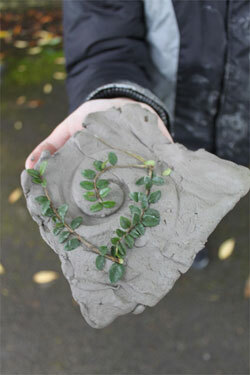 Make Belief - A six-month residency working with children and families to develop a series of fantastical narratives around Sceaux Gardens estate. 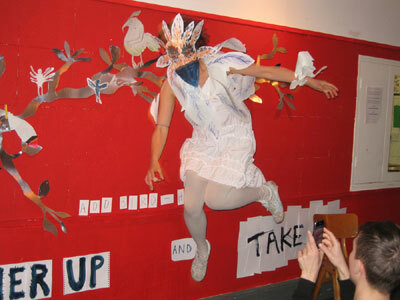 Part of the Making Play programme at the South London Gallery, October 2009 -March 2010. Approach:The residency involved facilitating the Saturday Club weekly workshops for local children of all ages (3-16) on an informal drop-in basis. Curated, themed and open activities, interventions and games were introduced to the children, alongside more conventionaly games and play. 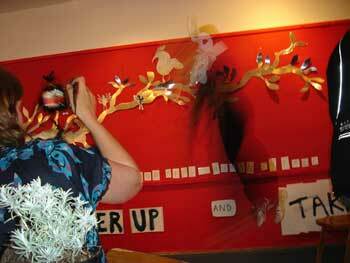 The place functioned as a social space, with art materials, toys and books available for anyone's enjoyment. The residency was based in a disused shop at the back of the estate, which was turned into a growing library and secret museum, a where new stories are created and shared. This was done through a gradual open process, by drawing and painting on the walls, sculpting the space and adding new stories to the library's walls, shelves and floor. The shop was used for many activities and experiments, some planned and some spontanious. 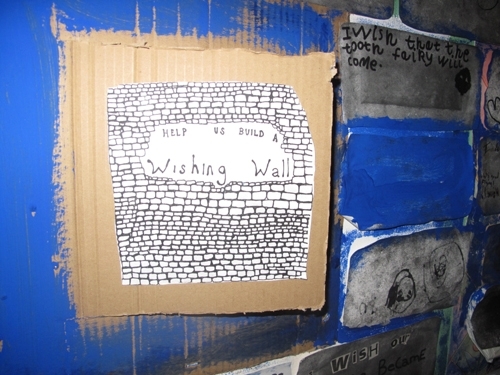 The wishing wall was an ongoing activity in which children would write and draw wishes on clay and paper bricks. The activity complemented discussions in which the children reimagined their neighbourhood and considered what they would change about it. 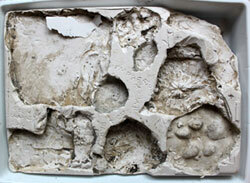 This wishing wall later became the starting point for mural for a hording on the site opposite the shop. Our House - A Creative-Partnerships project to develop SEAL, (Social and Emotional Aspects of Learning), literacy and geography and make use of spaces around the school as an extended classroom. 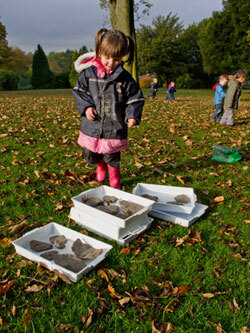 During this project the children explored different environments around and outside their classroom, initially documenting, measuring and describing different spaces, learning to make maps, routes and give instructions. The second part of the project involved making a story-trail, using different areas around the school to bring their literacy lessons to life. Parsloes primary school was hoping to turn a disused caretaker house on its premises into a new learning centre, and this project also set out to explored and demonstrate how children can be involved in the changes taking place in their environment. Parsloes Primary School, Dagenham, January- March 2010. Above -children created their own snail-trails around the school, photographing their snails, documenting how the snail feels about different environments and discussing whether the site in nice or nasty and why. 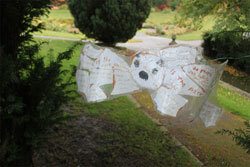 Below - children create maps of their school using photographs they have take. 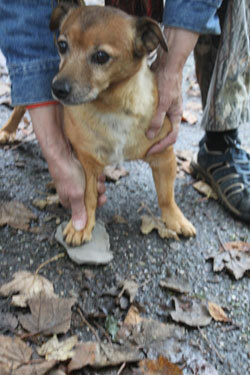 The second part of the project focused on changing environments. 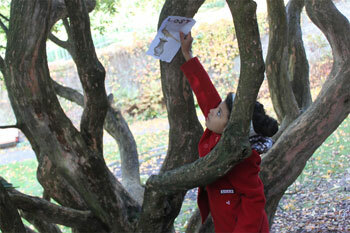 The children used their imagination to transform environments outside the classroom and bring a story to life. The children created a story-trail around the school based on Little Red Riding Hood, designing emotional wallpaper for two identical rooms, and transforming the between corridor into a forest of feelings. Emotional wallpaper: (Part of the story-trail created around the school.) Year 1 Children designed symbols of things that make them feel happy. 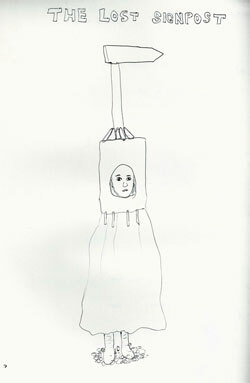 They collage their drawings which have been enlarged and repeated in order to create patterned wallpaper. The children's work transforms the reception room next to their classroom. This room formed 'Grandma's House', the first part of the story Little Red Riding Hood'. Above - Gingerbread man, satellite and flower. Once a week, children of all ages worked together on a range of different creative tasks in small groups, as a way of getting to know each other and developing a sense of belonging. Here children from reception to Year 6 worked in small groups to create collaborative drawing 'shields' where each child signed the shield and created their own unique pattern around it. 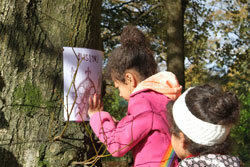 The drawings evolved from the centre and expanded outwards, extending with every child who signed their name. Games and Play- A two-day idea generation workshop for 2rd year students at Plymouth University, October 2009. The Streets as the Artist's Studio- A talk and one-day workshop for 2rd year illustration students at Maidstone University, October 2009. Easter Art Trail artist facilitator for a participatory arts event at Charleston, 12th April 2009. Out of the Page - Guest speaker and workshop facilitator, Falmouth University. 1st - 2nd of April 09. 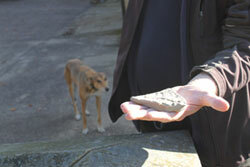 The Change- a talk followed by a two-day workshop for BA students at Hereford College of Art, exploring and inventing rituals. 25th - 26th March 09. Final artwork: a Snakes and Ladders floor vinyl. Using thought bubble templates, Youth Forum members write down what the characters are thinking. 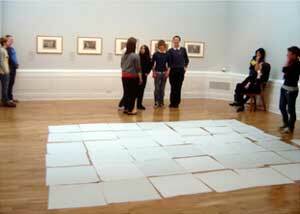 Left: Youth Forum trying out layout options for the floor-game in the gallery space. Right: final artwork installed. The final artwork was developed through weekly workshops that explored themes around free-will, fairness and changing moral values through group discussions, drama and drawing games, creative writing and making activities. The Youth Forum used the workshops to questions and respond to the series Industry and Idleness, which was calculated for the use Instruction of Youth in order to teach them right from wrong. 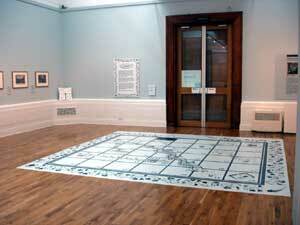 The final piece is a large-scale Snakes and Ladders floor vinyl, displayed next to the Hogarth prints, which gallery visitors are invited to play. Snakes and Ladders was originally invented in India in order to teach children the virtues of the Jain religion, with virtues in the shape of the ladders and vices in the shape of snakes. The Youth Forum used the game template to convey their own their own moral values through two-frame sequential comic strips, which are incorporated in the overall design, symbols that represent good and bad, which are used in the decorative frame, and a moral-choice questionnaire that guides the players through the game. March- May 2009, Graves Gallery, Museums Sheffield. 'The World in a Gallery'- facilitation of The Big Draw exhibition and workshop at the Artsdepot. Discovery- A two-day idea generation workshop for 3rd year students at Maidstone and Plymouth Universities. Spiral Festival- a commission to curate a weekend of creative activities and participatory performances for the public, inspired by the works of Anya Gallaccio and Chantal Akerman at Camden Arts Centre, August 30th and 31st 2008. Memory Exchange Bank at Spiral Festival: visitors write down a memory in response to the questions in the envelopes, and take away someone else's memory in exchange for their own..
Twice Upon A Time - A storytelling and bookmaking project with Year 4 students from Manor Side primary school, using Jim and the Beanstalk by Raymond Briggs as a source of inspiration. The students created new fairy-tales by revisiting and altering traditional stories, changing the personalities of the characters, combining different stories to generate new storylines and bringing in new heroes and heroines to save the day. The students then transformed their stories into unique sculptural book forms. SMALL and big - A moving-image and photography project with Year 6 students from Bell Lane Primary School, inspired by The Man by Raymond Briggs, in which the students created four different scenarios using the title Small and Big experimenting with perspective, ratio and distance, resulting in moving-image pieces that combine acting, mask-making, drawing and projection work. Including a development week run by the MAP consortium. Guest Speaker and workshop facilitator at Westminster University, Maidstone University, UCA Norwich and Hereford College of Art.